Does the idea of a vacation at a seaside location known as Devil's Point sound enticing to you? 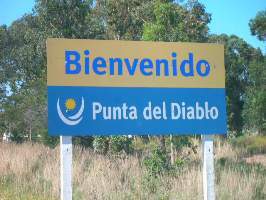 Then you should check out the quaint little fishing village known as Punta del Diablo. 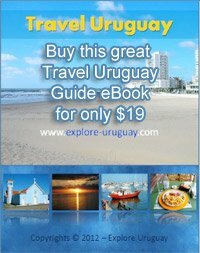 This city of Uruguay is becoming a popular stop for a number of adventurous vacationers from Europe, the US, Brazil and Argentina who are all searching for a setting that is a tranquil and a bit "off the beaten path". Punta del Diablo Uruguay is now earning a well deserved reputation as a favored vacation resort for visitors searching for an enjoyable experience in Uruguay. Instead of tall buildings, nightclubs and nonstop partying guests will be able to relax and unwind in a peaceful environment. Even though this little village is more rustic than many other beach resort areas in Uruguay it is conveniently located to Uruguay attractions such as the San Miguel Fort and Santa Teresa National Park. The town only has a small number of full time residents yet the peak tourist months of December and January bring thousands of tourists to this eastern Uruguay location. Punta del Diablo Uruguay has no high end hotels or 5 star restaurants to attract guests, but it is the natural charm and casual atmosphere that people find so appealing. Unlike the upscale beach resort of Punta del Este Uruguay, you will have to create your own meals and adventures when you visit Punta del Diablo. For the many guests who come to enjoy a quiet and relaxing respite this is exactly what they are looking to do during their getaway. Accommodations include a hostel or rent a small cabana or apartment and the inexpensive cost is a definite plus. While there may be a definite lack of restaurants and cafes you can buy breads and other items at the bakery or supermarket that is located in the center of the town. You can also opt to go fishing and catch your own meal. Local fishermen will also sell some of their freshly caught seafood to you and then you can enjoy the delicious flavors of steamed, grilled or roasted fish any time of the day or night. For many people it is this "back to nature" type of vacation adventure that attracts them to the shores of Punta del Diablo in the first place. The Atlantic Ocean seems to extend forever as you walk along the golden white beach, and as you gaze at the spectacular colors at sunrise and sunset it is easy to see why this region is known for possessing such an enchanting and magical charm. You can wade or swim in the water, or you can explore the area where the waves crash high against the breakers and try your hand at surfing. The sandy shoreline is the result of finely crushed shells that have been pummeled by the waves for millions of years. The winds can be gentle, but there are also times when they blow in from the ocean with a relentless and fierce power. in all of its magnificent glory each and every day? Surfing, fishing, and swimming are all popular pastimes for most visitors but exploring the coastal setting of Punta del Diablo offers its own adventures. You can walk around the little village, or for a small cost you may prefer to explore the town while on horseback. There aren't any official trails so you have the freedom to set your own course. While you may not take the horses directly on the beach you can still keep the coastline in view during the entire ride. When you visit Punta del Diablo Uruguay you will be able to experience a freedom that is rare to discover in most towns. It is as though you have taken a step back in time to a place where life is simpler, more tranquil and endlessly more satisfying. I visited Punta del Diablo Uruguay on my fourth day in Uruguay. Its a nice little town with beautiful beaches. It was interesting to see that the road to some good eats by the ocean was entirely sand. 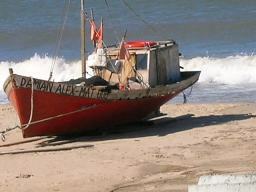 There were beautiful old fishing boats sitting on the beach and lots of kids playing soccer in the sand. 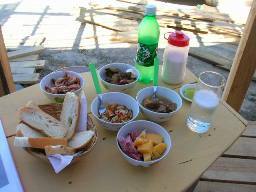 I asked the owner and chef to make me something that was a typical Uruguay food enjoyed by the people of Uruguay. The meal he made for me consisted of pickled mushrooms, salami and cheese, a bowl of unshelled, cooked crayfish, with some carbonated water and lemon. The meal was uniquely different for me since I had never eaten that type of meal. The mushrooms were very good, but I found the crayfish salty and had a hard time getting over the fact that They still had their shells and heads on. Those squinty black eyes looking back at me as I tried to gulp them down. The owners son laughed as he watched me try to eat them. I thought maybe they were just playing with me so I asked him if he would like a few of the crayfish. He happily crunched on their shells as I looked on.